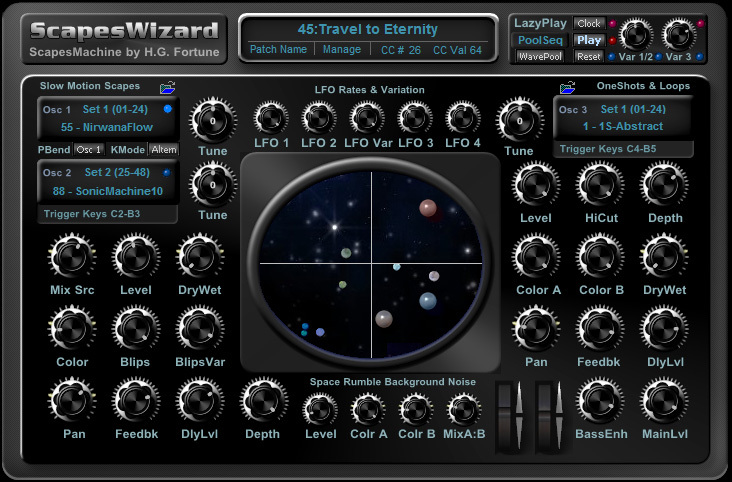 ScapesWizard is a soundscapes machine with very different control concept by triggering different samples via keyboard, or, using LazyPlay play a pool of waves in sequence or at random driven by inbuilt clock or triggered by keyboard.to advance manually. Basically you have a keyboard split to trigger a sample of Osc 1 & Osc 2 (alternating or Osc 1 only) from C2 to B3 (left side) and Osc 3 from C4 to B5 (right side). So simply give a key a short push and the resp. sample will play until it’s changed by pushing another key. For Osc 3 looped sampled can be faded out by giving key C6 a short push, and even you can retrigger it via key F6. The basic usage is intended to have a setting in motion and then play different samples and maybe with occasional tweaking of some knobs. Although there seem to be very few control elements most of these have a double function: left side is setting a dedicated value while right side adjusts modulation amount. Note those knobs with a marker at top/mid. There are four LFOs adjustable in Rate plus a Variation knob changing the waveforms for all 4 LFO. You will notice there are no LFO selectors at all present. This is due to the fact that no LFO is used directly. Always there is used a mix of 2 LFO controlled i.e. mixed by a 3rd LFO to achieve more complex modulation waves giving more variation. Anyway the small planets in the mid display show motion & amount of the resp. modulation.